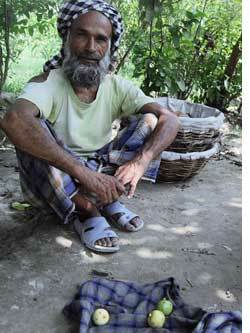 Hari Achal Singh has been a farmer for as long as he can remember. And that's as long as India has been independent. He recalls his childhood when his family depended on rain for irrigation. "We grew arhar (red gram), bajra (pearl millet), maize, jowar (sorghum) and a variety of wheat that did not require much water," said Singh. In the 1960s the Jawaharlal Nehru government laid a network of canals in Uttar Pradesh; irrigation became easy. "We started growing paddy then." Five rivers and two canals crisscross Pratapgarh district, but water in them has declined over the years. Paddy is a thirsty crop, so 15 years ago Singh dug a borewell in his one-hectare field in Ashapur village of the district.He found water about eight metres below the surface. He has deepened his borewell several times, and his crops have survived droughts in the past. He is not so sure this time. He has sown arhar and bajra but his borewell runs dry after one or two hours of pumping water. The well is 58 metres deep. "Drilling below this will be very expensive," said Singh. He blamed decreased rainfall and tree cover for the plummeting groundwater level. Pratapgarh's soil is non-porous, so water does not seep underground easily. This year's drought is unusual in the sense that it has hit areas that have good irrigation facilities or receive high rainfall. India has seen 22 major droughts since 1891, mostly in dry regions like Rajasthan. But this year, flood-prone Assam was one of the first states to declare drought. High rainfall areas like Bihar and well-irrigated areas like Punjab and Haryana also suffered drought, said J S Samra, chief executive officer of the National Rainfed Area Authority under the agriculture ministry. Drought and floods happened together. In Assam the Ranganadi and the Brahmaputra breached embankments after Arunachal Pradesh suddenly released water from reservoirs. This caused flash floods in four districts. In eastern Uttar Pradesh the Ghaghra, Sarada and Saryu rivers flooded several places in August. Farmers are not asking for food grain like in previous droughts; they want more electricity to pump groundwater, said Samra. 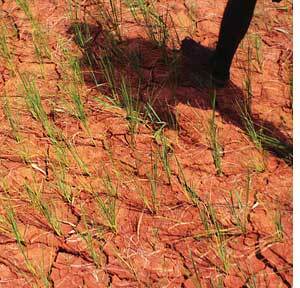 Droughts are not new to India but people used to grow crops sustainable in low rainfall. The cropping pattern has changed with the use of groundwater and expansion of canal networks, explained Anupam Mishra, head of the environment division of the Gandhi Peace Foundation. Punjab, Haryana and Uttar Pradesh are growing paddy, which was never the predominant crop there because these areas do not receive much rainfall. "We cannot go on extracting groundwater for long," said Vikram Ahuja, a farmer and agri-services businessman in Fazilka district of Punjab. A satellite study by the American space agency nasa conducted between 2002 and 2008 shows groundwater reserves in northern India have gone down drastically. In northwestern India the groundwater level is estimated to be going down at a rate of four centimetres a year. Over 109 cubic km of groundwater disappeared in the region between 2002 and 2008--double the capacity of India's largest surface water reservoir, the Upper Wainganga, said the study published in Nature in August this year. The Central Ground Water Board's estimates agree with the nasa study. "If measures are not taken to ensure sustainable groundwater usage, consequences for the 114 million residents of the region may include a collapse of agricultural output and severe shortages of potable water," warned Matt Rodell, the nasa hydrologist who participated in the study. 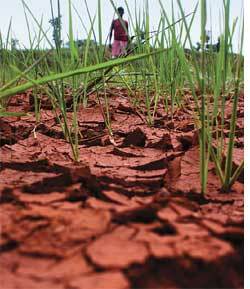 Changing forecasts by the India Meteorological Department (imd) made drought management difficult. The government declared drought one-and-a-half months after the first disturbing signals. In April, imd declared a normal monsoon, with rainfall likely to be 96 per cent of the long-term average. 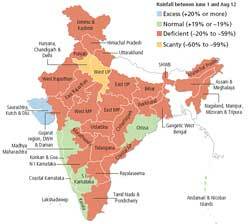 By mid-August the rainfall was almost 29 per cent below the long-term average (see map). On August 12, the Central government formed a Group of Ministers to assess the drought in the country, an admission of the fact that the situation is really bad. 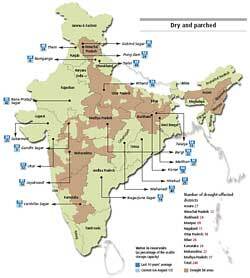 As on August 18, 246 districts in 10 states were declared drought-hit. Many of the 81 major reservoirs in India have less water this year. Usable water in the Bhakra reservoir is 49 per cent of the last 10 years' average for this time of the year, according to the Central Water Commission. Usually, reservoirs reach the minimum level by May-June and get refilled with monsoon rain (see map on facing page). "We went by imd's forecast and released water to the farmers at the normal rate. The level suddenly went down since no rainfall occurred in July," said Indra Raj, member of the water planning and projects wing of the Central Water Commission. With some rain in August, the Bhakra reservoir began to fill; by mid-August it had 60 per cent of last year's storage, he added. Himanshu Thakkar of the South Asian Network of Dams, Rivers and People, partially blames low levels in reservoirs on excess release of water from Pong, Ranjit Sagar and Bhakra dams to produce maximum power during election time in April. Thakkar said water in the Bhakra reservoir has been decreasing over the past 10 years. "Last year, Bhakra filled up to 44 per cent of its live storage (usable water), while this year it filled up to 38 per cent," he added. There are more reasons to worry. One is increase in the rate of evaporation. The mean rainfall has come down by four per cent from between 1912 and 1964 to between 1965 and 2006. But the usable rainfall (total rainfall minus evaporation) for the same period has decreased by 12 per cent, according to a study by the Indian Institute of Tropical Meteorology in Pune. The second reason is the rising trend of intense rainfall over a shorter period. This increases run-off. 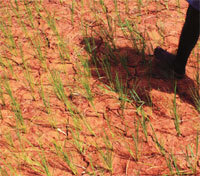 The result is increased vulnerability to drought. "August is the time when we have at least 3.5 feet (one metre) tall bajra, but this year the land looks as barren as nothing has ever been sown here," said Mewa Singh. "It drizzled just once in July. I have never seen this in 50 years of my life." Mewa Singh is better off than most other farmers in Bhungla village of Haryana's Bhiwani district, for he did not sow anything in his over-a-hectare (ha) field. He relied more on a jati tree in his backyard than the Met department's prediction. The jati tree didn't shed leaves this time like it does just before every monsoon. "It was green and our elders say it does not rain when the jati remains green," said Mewa Singh. Mewa Singh's friend Mahadev Singh, pradhan of Gokulpura village in Bhiwani, has invested about Rs 35,000 on sowing cotton and bajra in 1.2 ha.His first two attempts at growing bajra failed because it didn't rain. He bought seeds again and sowed for the third time, hoping it may rain in August. He ended up spending Rs 10,000 on seeds. "These hybrid seeds cannot survive high temperature, but the seed companies have benefited," said Mahadev. He is sustaining cotton with water from a tubewell. Bhiwani adjoins Churu in Rajasthan, which has the highest temperature in India for most part of the year. The soil there is sandy and the groundwater below 120 metres, so farmers mainly depend on rainfall for irrigation. 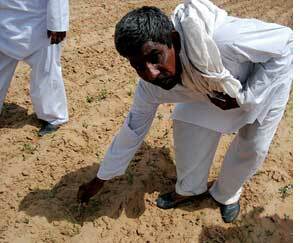 "This year sowing is at least 20 per cent less than normal in Sirsa, Bhiwani, Rohtak and Fatehabad. Still the government has not declared these districts drought-hit," said Gurnam Singh, state head of the Bharatiya Kisan Union. "If the dry spell continues farmers will soon become part of the wandering tribes like construction labourers," said Azad Singh, pradhan of Bhungla. All 500 families in Bhungla depend on dairy besides farming. Since the area under cattle feed has also gone down, people are forced to buy dry cattle feed from the market at Rs 170-180 per mann (40 kg)--up from Rs 50 per mann last year. Azad Singh said he is spending Rs 150 on a buffalo every day. The profits have come down because the milk of underfed buffaloes is not so rich in fat. "Cross-bred cattle cannot tolerate high temperature and by the end of June many were sick," said J S Samra, chief executive officer of the National Rainfed Area Authority. The area under major kharif crops in India like paddy has decreased by 5.7 million ha (20 per cent) compared to last year because of deficit monsoon, said the agriculture minister. The ministry estimates the area under oilseeds has also gone down by 0.6 million ha. More farmers have sown coarse cereals, like bajra, jowar and maize, and pulses this year. The area under these crops has increased by 1.8 million ha (see table Decline in kharif sowing). In Assam 1.3 million ha of cropland is affected, said Pramila Rani Brahma, state agriculture minister. Assam would be able to produce only half of the 3.9 million tonnes of rice it needs, the minister added. In Punjab, Subhash Chandra Godhara sowed genetically modified Bt cotton for the first time in May end. He invested about Rs 15,000 on seeds. Two months later he was still waiting for the saplings to grow in his 4 ha in Gumjal village of Abohar district. In the interior parts of Punjab, one gets a yield of 1,600 kg of cotton per acre (0.4 ha) but in Abohar it is usually 400 kg. "This year I am not expecting even that, though I have invested more," said Godhara. He has leased the rest of his 20 ha to Punjab Agro Industries Corporation at an annual rate of Rs 10,000 per acre. Abohar is at the tail end of Bhakra canal and faces severe water shortage, and Gumjal is the last village of Punjab before Rajasthan. "We are not the Sikh vote bank and that's why the government is not concerned about us," said Surender Kumar Jakhar, chairperson of Indian Farmers' Fertilizers Cooperative Limited (iffco) who belongs to the region. "Canal water is regularly reaching Sangrur and Muktsar, where chief minister Parkash Singh Badal's land is. It even goes to a village in Rajasthan for two days in a week where Badal has land, but not here." The Bhakra canal is releasing 20,000 cusecs of water every day--8,000 cusecs less than normal. As a result, power production is low. Electricity is being diverted from urban areas to farmers. Industrial units are closed for three days a week in Punjab to supply electricity for irrigation, said Samra of the rainfed area authority. The diesel sale has gone up 40 per cent in the state, he said. The Centre declared a subsidy of 50 per cent on diesel for farmers on August 3. Uttar Pradesh has demanded Rs 2,000 crore from the Centre to pay for 10 hours of power supply in its 58 drought-hit districts. The Met department advised that farmers take up short-duration crops--like some varieties of bajra, oilseeds and pulses that ripen in two months--this season so that the rabi sowing in November is not delayed. Farmers in Uttar Pradesh are not aware of the advisory. Even those with meagre landholdings continued to transplant paddy saplings that take at least three months to harvest. Zikr-ul Hasan, a farmer in Kannauj district, transplanted paddy saplings in a bigha (0.084 ha) after an intense but brief shower in the end of July. The crop was already yellowing when Down To Earth met him a week later. "And this is the bagad (riverbed) area. The Ganga flows just two kilometres from here," said Hasan. He is using tubewell water. "Running a tubewell on diesel costs Rs 300 per hour," he said. Since paddy fetches a good price in the market Hasan hopes to make some money. "Seventy-five per cent of the agricultural land in Uttar Pradesh is under paddy and that is why we are hit hard," said Mohammad Kalim Khan, the district head of the Samajwadi Party in Kannauj. In the guava orchard next to Hasan's field, the yield has been down to a seventh of last year's. "The fruits are infested with worms. We have to bury them so that animals don't eat them and fall sick," said orchard owner Fazal Ahmed. He could sell guavas for not more than Rs 1.5 per kg. "This is less than the rate of salt. I am barely recovering the labour cost, forget about profit," he added. Forty per cent crop was lost in Pratapgarh district of Uttar Pradesh until July; if it does not rain anymore the loss will go up, said Ketki Singh, district chief of the Bharatiya Kisan Union. Pratapgarh has dug 60 ponds under nregs but not one of them collected rainwater, said Bhaiyyalal Patel of Samajwadi Party. "That is because all of them have been made where the gram pradhan wanted them, without considering the gradient and slope," he added. Drought has forced small farmers to work as labourers in others' fields. In Badi Sonahi village of Pratapgarh, Shobhavati and her friends got a job for six days to transplant rice in their neighbour's fields that has a tubewell. "We have a four- biswa (one biswa is 125 sq m) field but no water. So we left it unsown his year," said Shobahvati. "My husband is working at the nregs site and gets Rs 60-70 a day. He has gone there for 10 days this year. We are barely surviving with this earning."